My name is Maureen and I am a germaphobe. When my daughter was diagnosed with asthma, I became somewhat obsessed with hand cleanliness in order to prevent illness. Despite lots of eye rolling and exasperated sighs….my children would reluctantly march in to wash their hands numerous times a day at mom’s request. Thanks to SoapTime™ my three children are now actually requesting to wash their hands and they are doing it with a smile on their face. These liquid soap dispensers are so fun and creative and I love that it was created without harmful chemicals. They eagerly wait for Professor Goodhabits™ to make washing your hands a fun, learning experience that teaches healthy habits since this fabulous soap dispenser actually talks to your child and has music, lights and fun facts. How does it work? SoapTime™ is easy to use because it includes a SmartBase™ and interchangeable soap dispensers. The child simply pushes the dispenser and for 20 seconds they wash their hands while listening to music and fun facts and watching a nice light display. I was very impressed that the SmartBase™ has a 2,500+ wash cycle battery life! It really works because my six year old son is now currently “educating” anyone who will listen that you have to “wash your hands for 20 seconds if you want to get rid of the germs that make you sick.” That’s my boy! When it is time to change dispensers it is very easy to simply add a new SoapTime™ dispenser to the SmartBase™ and it automatically updates itself to match the new dispenser. My children’s favorite is the Elephant soap dispenser and they love to sing along to the tune that an “Elephant never forgets to wash his hands……….” There are fun facts too about animals like tigers, zebras and birds. Did you know that a tiger actually has the same striped pattern on his skin under his fur? My personal favorite is the Earth soap dispenser. With fun facts about our world and even blue whales there are loads of fun even for grown-ups too although the kids don’t like to share it with me reminding me “mommy, you have your own soap”. It also helps children learn how to count from 1 to 10 in Spanish which my four year old daughter likes to practice while scrubbing her hands clean. I really like that SoapTime™ is non-toxic and that the soap scent is fresh (lavender, orange and apple) but not overpowering. My children actually enjoy washing their hands and I am confident that they are learning good hand washing habits and lots of fun, interesting facts too. SoapTime™ is currently available at select Bed, Bath & Beyond stores nationwide but stayed tuned to the SoapTime™ website for additional online availability and more store locations near you. You are invited to visit SoapTime™ to learn more about this wonderful line of liquid soap dispensers created just for kids. Learned SquidSoap features an ink marker located on top of the pump dispenser so that when the pump is pushed down to dispense the soap, the hand is marked with an orange dot. The mark washes away with a 20 second wash, ensuring clean healthy hands! That kids get between 9-12 colds a year!!! The squid soap leaves an orange dot on your hand when you push down to dispense the soap and stays there until they wash their hands for 20 seconds and it goes away! Great way to get them to wash better! I learned you have to wash your hands for 20 seconds to get them clean. I seriously didn’t know that! i learned that: Depending on their age, children catch an average of 9-12 colds per year. The best way to prevent a cold and illness is to teach them proper hand washing (Web MD). and that is Why is hand washing so important? I had no idea that kids get so many colds per year! I learned that kids get between 9-12 colds a year. I learned kids can catch an average of 9-12 colds a year. My kids are living proof! 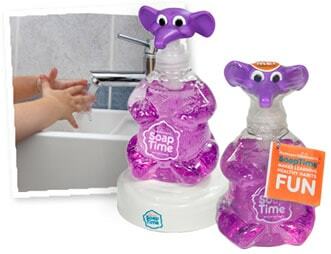 SoapTime products were created to give children of all ages a fun & engaging experience at the sink, while providing parents a tool for teaching healthy habits for life. I love the concept of squidsoap (it takes about 20 seconds to wash the dot/mark off your hands so you HAVE to wash it clean). I learned that SoapTime products were created to give children of all ages a fun & engaging experience at the sink, while providing parents a tool for teaching healthy habits for life. I learned that children catch an average of 9-12 colds per year. I learned If soap and water are not available, use an alcohol-based hand sanitizer that contains at least 60% alcohol. Alcohol-based hand sanitizers can quickly reduce the number of germs on hands in some situations, but sanitizers do not eliminate all types of germs. I learned kids get 9-12 colds per year. Depending on their age, children catch an average of 9-12 colds per year. They have squidsoap on their site! I’ve tried it before at a friends house and love it! SoapTime products are tested for a shelf life of 3 years from the date of manufacture listed on the bottle. The Smart Base can be reused indefinitely with proper care & battery replacement. i learned that SquidSoap is great for older children that already know to wash their hands; they’re just in a hurry, don’t think about it, or haven’t instilled proper hand washing as a natural part of their routine. I learn that kids get 9-12 colds a year. I learned SquidSoap which is for kids 7 and older features an ink marker located on top of the pump dispenser so that when the pump is pushed down to dispense the soap, the hand is marked with an orange dot. The mark washes away with a 20 second wash, ensuring clean healthy hands! I learned all SoapTime bottles are coded for recycling. The website says- “Depending on their age, children catch an average of 9-12 colds per year”….but I don’t think those numbers are high enough. We had a new cold everyother week last school year. I learned they also have squid soap! I learned that, depending on their age, kids can catch btwn 9-12 colds per year. My daughter(6) loves using scented soaps/lotions and these would be so fun for her. I learned that the company is located in Austin, Texas.